There’s nothing like seeing Venice for the first time. Whether you arrive from the mainland crossing the lagoon by train, or moors in the heart of the city from the sea, this enchanting city captures you at first sight. With 150 canals and 400 bridges, this unique urban masterpiece which has waterways instead of streets, boats instead of buses, and old bridges instead of subways. Let Venice amaze you! You’ll experience the perfect historical and artistic introduction to Venice on this private walking tour of the city’s highlights. During this Venice orientation tour you’ll see the city’s stunning waterways and the bridges that link more than a hundred small islands. 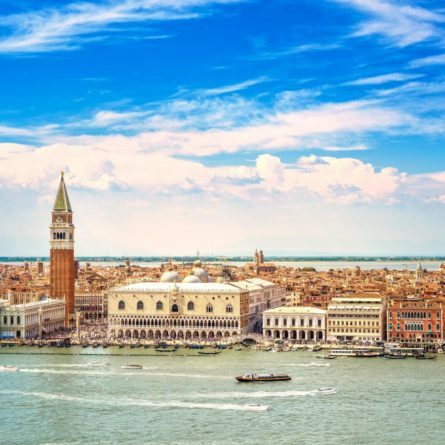 Learn about Venice’s historical power as a sea-trading empire, its political links with both East and West, and its beautiful art which is scattered throughout the city and showcased inside historic buildings or at outside monuments. Finally, you’ll get a true sense of Venetian romance as you glide across the sun-dappled waters of the Grand Canal in a private gondola. This is truly an unforgettable experience! Your private English-speaking guide from Italy’s Best will provide the perfect historical and artistic introduction to Venice. Your tour begins at the elegant Piazza di San Marco, the political and religious heart of Venice for more than 1,000 years. At the eastern end of the vast piazza is the Basilica of San Marco, built in 1063. With its Byzantine style domes and its stunning golden mosaics, the Basilica is a testament to Venice’s historical power as a sea-trading empire as well as to its political links with both East and West. Our next stop will be the adjacent Palazzo Ducale, or Doge’s Palace, the seat of the Venetian government until Napoleon’s conquest in 1797. Today Doge’s Palace houses a myriad of Renaissance masterpieces, including Tintoretto’s Paradiso, one of the largest canvas works ever painted. Here, see the famous “Bridge of Sighs,” then conclude your tour with either a climb up to the Loggia dei Cavalli for a close-up view of the famous equestrian statues, or a visit to the Basilica’s Pala d’Oro, a stunning gold altarpiece. This private tour takes in the Castello district of Venice, including the Arsenale. The tour includes a vaporetto trip to Palladio’s San Giorgio Maggiore. This private Venice art tour is aimed at art lovers through a visit to the Frari church and school of San Rocco, with work by Titian and Tintoretto. This private skip the line Vatican tour explores the splendors of the Vatican Museums, from the Raphael Rooms to the Sistine Chapel, as well as St. Peter’s. Tour the hills of Florence from Piazzale Michelangelo to the nearby village of Fiesole in the company of a private driver and expert licensed guide.